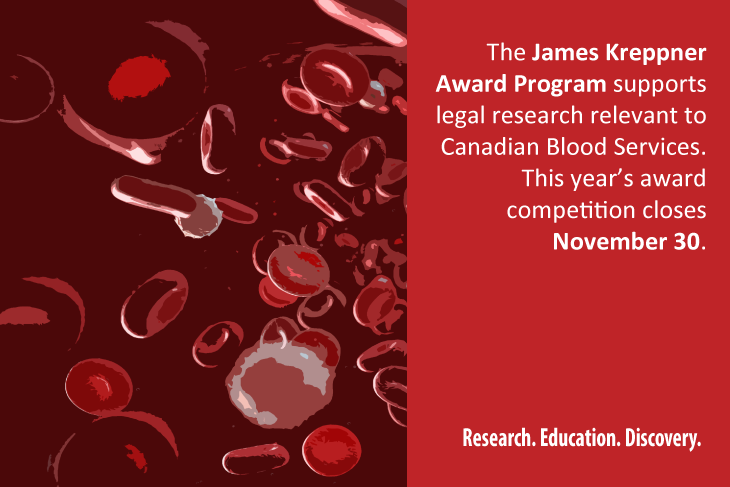 The James Kreppner Award Program supports legal research relevant to Canadian Blood Services. This year’s award competition closes November 30. Nov. 26 marks the 20th anniversary of Canada’s public inquiry into the contaminated blood crisis of the 1980s and 1990s, which culminated in Justice Horace Krever’s recommendations for a national, accountable, public blood service. In response to the tragedy, governments of the day created Canadian Blood Services in September of 1998. The organization is observing Krever anniversary in several ways. One of these is drawing attention to the award given in the name of the late James Kreppner. James Kreppner was a lawyer and patients’ rights advocate. He had a severe form of hemophilia-A, a genetic disorder that makes it difficult for blood to clot, and his condition often required transfusions of blood products. In 1985, he became infected with HIV and hepatitis C through tainted blood products. Because of his experience, Mr. Kreppner became a key figure in establishing the public inquiry into contaminated blood and testified twice before the Commission. He was also a longtime volunteer and member of the Canadian Hemophilia Society and eventually became a much-valued member of the Canadian Blood Services’ board of directors. The James Kreppner award was established posthumously to honour his contributions to Canada’s blood system and his commitment to blood safety. Research priorities for the James Kreppner Award include the legal and regulatory aspects of (a) donation, collection, storage, and use of blood, blood products, and hematopoietic stem cells; and (b) organ and tissue donation and transplantation. The 2017 Award will support one project with up to $50,000 for a period of one year. This year’s competition closes Nov. 30, 2017. ~ Maeghan Toews, 2014 James Kreppner Award recipient. Dr. Danielle Martin, author of Better Now: Six Big Ideas for Improving Health Care for All Canadians spoke at Canadian Blood Services' board retreat in April 2017.